Special character symbols from the set of Unicode characters like ☐, ☑, ⚐, ⚑, ▲, and ▼ can be useful for many different things in Excel. You can use them in drop-down lists, charts, custom number formats, dot plots and in-cell pictographs. As the Office software and web browsers continue to support the display of more symbols, I expect the use of special characters will make it possible to do even more cool stuff with Excel. I created this page so that I would have a quick reference for the types of symbols that I use frequently in Excel. Why? 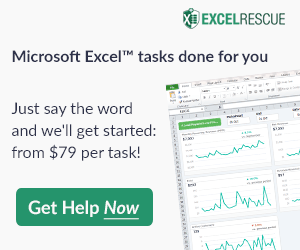 Because the Insert Symbol feature in Excel doesn't include many of the symbols I like to use, and one of the easy ways to get a symbol into Excel is to copy/paste the symbol from a web page. There are many places on the internet to find lists of unicode characters. Usually, you can just select the unicode character from your browser and press Ctrl+c to copy it, then Ctrl+v to paste it into Excel. If you are editing the text or formula within a cell, then it will paste just the character (instead of the formatting from the web page). In the more recent versions of Excel, you can browse some of the unicode characters using the Insert > Symbol dialog. It will tell you the name of the symbol as well as the character code. Unfortunately, the Insert Symbol tool does not list many of the extended Unicode symbols. If you would like to see this tool improved, please visit excel.uservoice.com and Vote For My Suggestion. If you have found the Decimal code (which I have listed on this page for many symbols), you display it in html as &#NNNN; (leaving out the "x"). Some special characters can be inserted by pressing ALT+#, where the # is entered using the number pad. Hold the Alt key while you press the number sequence then lift up on the ALT key. I've only learned one code by heart: ALT+0169 is the © symbol. See the references below for a list of ALT codes. You may already be familiar with how (c) automatically changes to © and (r) changes to ® in Office applications. When using this feature, you type (c) and then either press Enter or another character, and Excel changes it to ©. If you don't want that to happen, you can press Ctrl+z to undo the auto-correct. The cool thing is that you can add your own custom shortcuts for the special characters or symbols that you use the most. In Excel 2013/2016, go to File > Options > Proofing and click on Auto-correct Options. A window will pop that lets you define shortcuts for special symbols. I've been doing this for years, and have found that using the abbreviated name or graphical representation in parentheses works great. For example (plusmn) for ±, and (middot) for the dot you place between units in labels like N·m (Newton-meter). 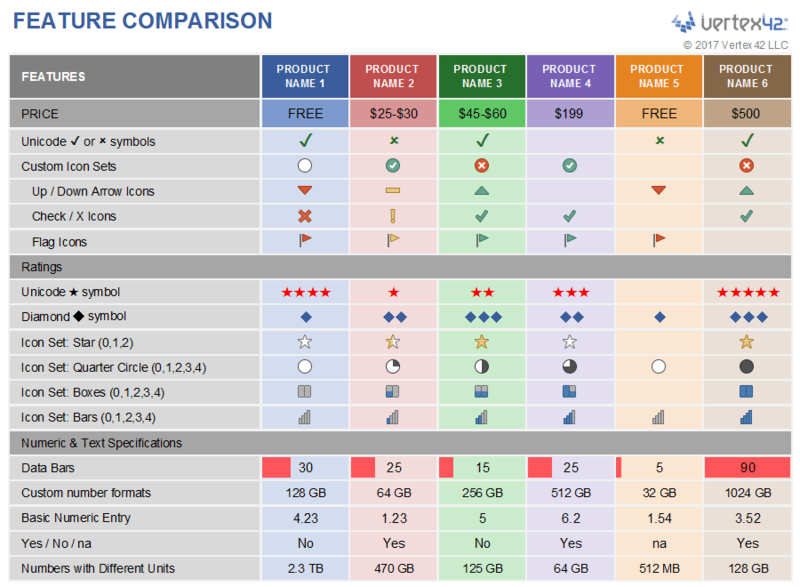 The table below lists only SOME of the thousands of symbols you might want to use. Some of the names in parentheses are the same named used for the HTML equivalent, such as &deg; for ° and &divide; for ÷. Others are just examples of what I like to use such as (->>) for ►. The UNICODE and UNICHAR functions have been available since Excel 2013 and are similar to the older CODE and CHAR functions. If you want to try something fancy, you can use the following array formula (press Ctrl+Shift+Enter after entering an array formula) to return an array of Unicode values for each of the characters in a text string. Using special symbols or dingbats within drop-down lists is a great substitute for a checkbox in Excel. I've demonstrated this in various task list and action item templates. You can also use stars or flag symbols for flagging priority items in a list. The feature comparison template demonstrates how you can use a data validation drop-down list to create a star-rating by entering ★,★★,★★★ into the Source box for the list. 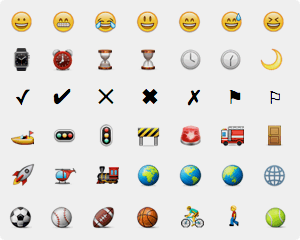 For a larger list of emoticons, see this page. You can use the =REPT(text,number_times) function to repeat a character, as demonstrated in the article "Create a Dot Plot in Excel". Below is an example of a very basic in-cell pictograph. One of the problems with using symbols for pictographs is that the REPT() function cannot display a fraction of a symbol. If you need a graph to show decimal values rather than just whole numbers, you can create a small picture (such as a screen capture of a Unicode character) and use it within an Excel chart to create a pictograph like the example below. If you would like to see Microsoft make it easier to use Symbols as a Fill option, go to excel.uservoice.com and Vote for My Suggestion. Data bars are often used in spreadsheet dashboards to show in-cell bar graphs. They can also be used for progress bars if the cell is scaled to 0%-100%. 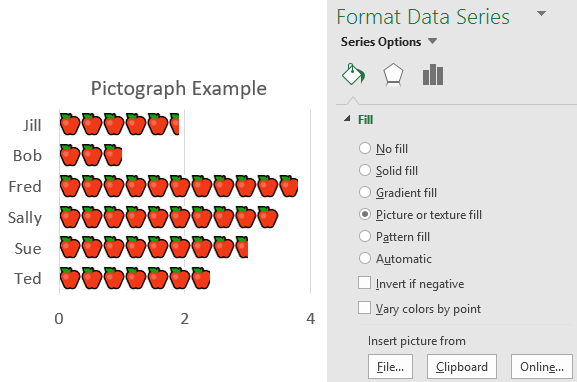 You may not need to use this technique for in-cell graphics in Excel any more because of the awesome conditional formatting options. However, Google Sheets does not have in-cell data bars yet, so using the REPT() function is one way to create something like a data bar (see the image below). The table below lists the main characters I use for this technique. Note that although there are some skinny bars (like 9612), for data bars you need to use the characters that do not include any blank space. What I call a "sprint chart" or "sprint progress chart" is a simple graph that shows progress relative to the amount of time left. This technique can be useful as a visual aid in Agile Product Development. The "sprint" period is represented as a number of days, with a flag for each day. The filled-in flags ⚑ represent the percent completed and the watch or hourglass symbol represents the current day. The example chart below is showing multiple teams' race against time. =REPT("⚑",MIN(time,complete)) & REPT("⚐",MAX(0,time-complete)) & "⌛" & REPT("⚑",MAX(0,complete-time)) & REPT("⚐",sprint-MAX(time,complete)) & ""
These are the symbols I like to use for up/down signals. The dash is obviously not an arrow, but the this dash symbol works well as a "zero" when using the up/down symbols in custom number formats (see the examples below). There are a LOT of different kinds of arrows, but I use these triangles more often than other arrows. See my Unicode Symbols page for a huge list of arrows. In combination with a custom number format of "@*-" and merged cells, the scissors can be used in forms like a remittance slip on a billing invoice to create a guide for cutting. There are symbols for each hour and half hour on the clock. See this page for a full list. These symbols can be used to create a Moon Phase Calendar in Excel. The template I created uses the symbols within conditional formatting rules and custom number formats. Special characters can be used within custom number formats as a substitute for conditional formatting icons. You can also use this technique to format numbers that appear in charts! Take a look at the examples below. If you haven't seen color codes like [ColorN] used in custom number formats before, you can read this article. I created the graphic below to show how the [ColorN] codes correlate to the the old .xls color palette. I created the squares (█▌) next to the color codes by combining the █ and ▌ characters. 1. Feature Comparison Template - This template demonstrates many different ways of using unicode characters and conditional formatting, including check boxes and star-ratings within drop-downs. 2. 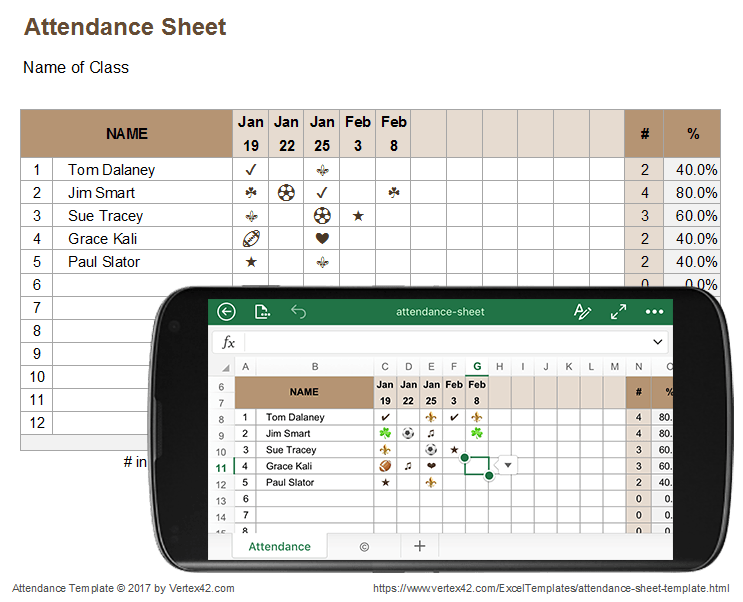 Attendance Sheet Template - This template shows how you can use fun symbols for taking attendance instead of a boring "x". The COUNTA() function will count the cells that aren't blank, so it doesn't matter what symbol you use. These characters look even better in the Excel app on an iPhone. The Unicode emojis and emoticons do not necessarily appear the same in all browsers and apps, but it's worth pointing out that most of these symbols can be displayed in new versions of Excel. The following table provides a quick way to look at some of these symbols. To browse a huge list of Unicode symbols, see my Unicode Symbols page. To use one of these characters in Excel: you can copy/paste a character from the table below. After copying the emoji character, you can paste it within a formula or anywhere else that you might paste a text character. One of the main benefits of using Unicode characters instead of Symbol and Wingdings fonts is that the Unicode characters will show up correctly in drop-down lists and you can use them in formulas and custom number formats. If you change the font of a cell to wingdings, the formula may still be readable in the Formula bar, but it is unreadable when editing the formula within the cell. I've also had fewer compatibility problems when using common Unicode characters than when using special fonts. ✅, ❎ : Codes that are a specific color in a browser show as black/white in Excel desktop and the color can be changed. But changing the color of these won't work in Excel online or Google Sheets, which are browser-based apps. ,,,,,,, : Some emojis render the same way they appear in texts on the iPhone when used within the Excel mobile app. Need to convert HEX codes to Decimal? Use the HEX2DEC() or DEC2HEX() functions in Excel. The UNICHAR Function at support.office.com - The official syntax page. RapidTables.com Unicode Character Symbols at rapidtables.com - A useful place to browse the Unicode characters. Gives the HTML code and the Unicode. Unicode Blocks at fileformat.info - lists blocks of symbols by category, including many of the newer symbols. This is an awesome reference tool! Fantastic reference material. Kudos to you and your team! found this and thought it’d solve my problem, but unfortunately no. Struggling with not being able to display this sign: [link no longer works] (resp. 037C) in an Excel 2003 file. I get it to work in another PC (also Excel 2003, installed from the same CD, using Insert–> Symbol), but not on my own. Logically, I don’t get it. What am I doing wrong — and can you help? BIG thanks in advance. From what I understand, not all Unicode symbols are supported by all computers or devices or fonts. I’ll admit that I don’t understand exactly how it all works. See Unicode.org to get more technical information about Unicode characters.